So to remove your eye makeup, just use an oil and a cotton pad. Olive, jojoba and coconut work great. (Just be careful with coconut oil if you have acne prone skin, it can clog your pores). Another thing you can use instead of oil, is rose water. Just spritz on a cotton pad. Witch hazel mixed with jojoba and rosewater does a great job too. Dr Bronner Castile Soap: It is best to get the baby unscented one. Add an oil to it and more ingredients you want like coconut milk, rose water, honey, tea tree oil, glycerin and vitamin E.
If you have acne prone or oily skin add: Jojoba ( best because it won’t clog your pores. ) Then raw honey and tea tree oil. You can also add rose water or green tea, which are both amazing for this skin type. These ingredients are the best. Soap Bar: There are so many natural soaps you can choose from to cleanse your skin! One you can try for example is, African Black Soap. People had amazing results from it! Just make sure you get the real one. There are also clay, charcoal and oatmeal soaps that are all natural which you can try. Honey Oat Cleanser: Honey and oats are both incredible ingredients for your skin. Honey is naturally antibacterial and helps fight blemishes and pimples and oats have saponins in them. and You can use both alone or combine the two. You can also add an oil to the mix like jojoba and tea tree. Rosewater Cleanser: Mix rose water, glycerin, jojoba and tea tree oil. For extra power you can add witch hazel too. If you have sensitive skin be very careful with essential oils though! All you need. It is perfect for all skin types and leaves your skin healthy, glowing and refreshed. Other toners you can use are: Witch hazel, green tea, chamomile, sea salt, rice milk and apple cider vinegar. To moisturise you can use nourishing butters and oils. They have so many skin benefits and vitamins! Just make sure to use natural, cold pressed and unrefined. Mixing Rose hip oil with vitamin E, for example, makes an amazing natural moisturiser. There is also Aloe Vera and glycerin if you want a non greasy option. Both are also incredible! For oily/acne prone skin a great moisturiser would be jojoba with aloe vera and tea tree oil if you want. Honey is a humectant and makes a great natural moisturiser also. Exfoliating regularly is also a very important step to add to your skincare routine. Just mix sugar or blended oats/lentils with an oil like almond. Add ingredients like vitamin E, coconut milk and honey if you want. To exfoliate and firm the body, add coffee grounds. 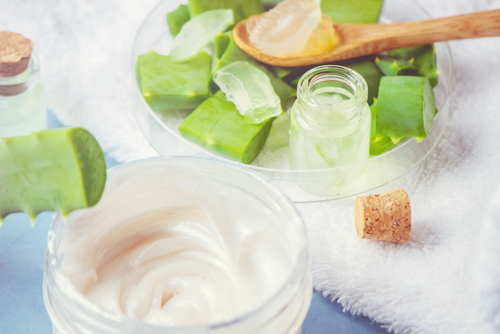 And when buying products for your natural skin care routine, make sure they are all natural too. A lot claim to be natural, but are not fully.